Get everyone together and enjoy your time around the Weave 48"Round Outdoor Fire Pit Patio Table in black tippet. 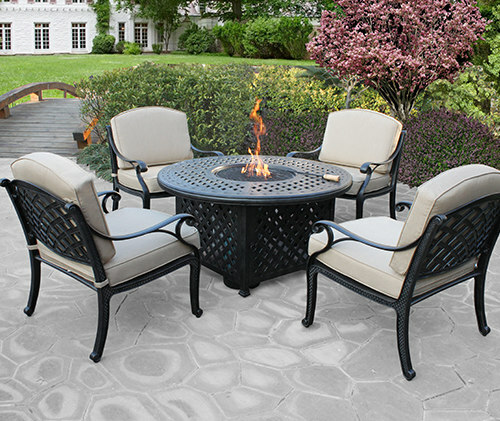 The ultimate for outdoor entertaining with family and friends this round cast aluminum patio dining table features a fire pit perfect to keep you and guests warm on cool evenings or help create that perfect ambience. The fire pits use propane gas and includes a storage area under it for hiding your 20 pound propane tank. This outdoor patio dining table has a classic cross weave pattern for a timeless look. All of our cast aluminum frames are rust resistant and designed to withstand rain or shine.